A lifetime of good health starts in childhood. Quality pediatric care in central Massachusetts starts here at Community Health Connections so your child can get off to a happy and healthy start. The cornerstone of pediatric care is what we call “family-centered care” – that is, an approach to pediatric care that recognizes the vital role that families play in ensuring the health and well-being of children and family members of all ages. This proven pediatric care approach is founded on the collaboration of the family and our nurses and staff to plan, provide, and evaluate care – after all, no one knows your child better than you. At Community Health Connections, we understand that emotional, social, and developmental support are integral components of family health care, and especially pediatric care. We respect every child’s and family’s unique strengths and view the health care experience as an opportunity to build on these strengths and support families in their care-giving and decision-making roles. Family-centered approaches to pediatric care lead to better health outcomes and wiser allocation of resources as well as greater patient and family satisfaction. We have found that the benefits of family-centered pediatric care go far beyond the immediate impact of this approach. Our pediatric care practitioners are keenly aware that positive health care experiences can enhance parents’ confidence in their roles and, over time, increase the competence of children and young adults to take responsibility for their own health care throughout their lives, particularly as they prepare to transition to adult service systems. 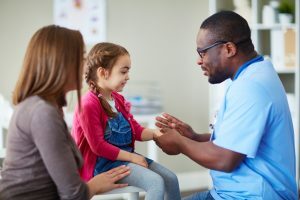 Family-based pediatric care not only can improve patient and family outcomes, increase patient and family satisfaction, and build on child and family strengths — it can increase professional satisfaction, decrease health care costs, and lead to more effective use of health care resources. To learn more about our pediatric care services, we invite you to email us or give us a call today.